I am thrilled to announce that as of September 2017, I will be joining the faculty of New York University's Music Department! As Clinical Assistant Professor of Performance, I will offer lectures and seminars and run ensembles as well as teach private lessons and chamber music coachings. Of course, I will continue to perform with ICE and with my friends around the world, but I am so looking forward to surrounding myself with young, curious and talented minds and spirits as I help to shape the performance life of this exceptionally intellectual department. The Atelier's performance on Resonant Bodies Festival 2016 was a special moment and a resounding success! Read more about our work "The Grand Cross" here and read the review of the fantastic festival! We stand at the precipice of the abyss, the darkness of overwhelming interference. What is meant to be edifying serves only to muddy our understanding. In an abundance of knowledge, we are left only with incertitudes; flickering, straddling, mercurial, slipping away, the Truth evades. We find refuge and clarity internally: briefly, the body becomes the entire universe. The austere age of loneliness . . . 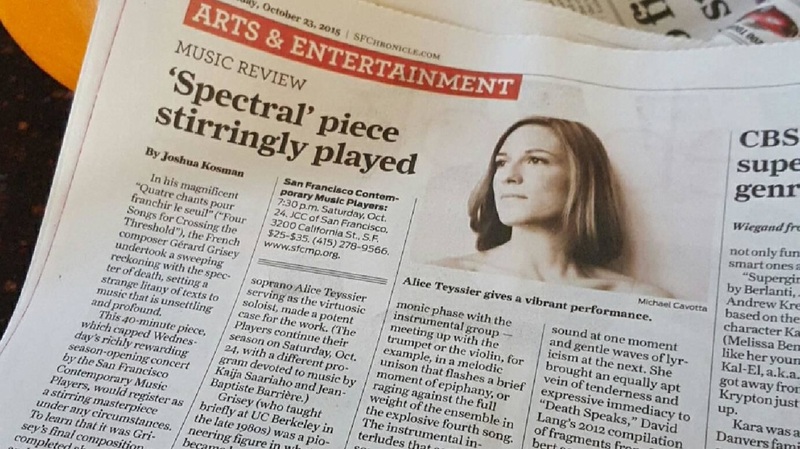 Excited to have this extremely special performance reviewed in the San Francisco Chronicle! "...the majesty and evocative grandeur of Grisey’s writing are irresistible. And Wednesday’s performance at the San Francisco Conservatory of Music, with Artistic Director Steven Schick leading a large instrumental ensemble and soprano Alice Teyssier serving as the virtuosic soloist, made a potent case for the [Quatre chants pour franchir le seuil]. Teyssier gave a vibrant, clear-toned performance, unleashing torrents of sound at one moment and gentle waves of lyricism at the next. She brought an equally apt vein of tenderness and expressive immediacy to “Death Speaks,” David Lang’s 2012 compilation of fragments from Schubert songs set to moody minor harmonies..."
Pretty amazing to be featured in the New York Times for a incredible performance of Oscar Bianchi's tremendous work 'MATRA' during the MATA Festival at the Kitchen in New York. So excited to announce that I am officially joining the roster of the International Contemporary Ensemble (ICE)! Highlights include premieres at the Mostly Mozart Festival, a recording of Jason Eckardt's 'Tongues' and portrait concerts of Rand Steiger and Liza Lim at Miller Theatre. My second DMA recital is coming up: an evening of "seconds"! As exciting and rewarding as it is to present premieres of pieces, I have always believed that performers play an enormous role in giving life to a piece, starting with a second performance. This concert is extremely special to me in that I am presenting two works that were written for me in the last two years, both for the second time. Jonathan Hepfer and I premiered Lewis Nielson's 'Herzplatten', a duo for percussion and voice/flute, in January 2014 on his DMA recital. Rolf Riehm's stark and challenging 'Pasolini in Ostia', a passion on the death of film maker Pier Paolo Pasolini, was premiered at the Monday Evening Concerts in April 2013. I feel so honored to have been featured in the San Diego Union Tribune as a "Face to Watch"!